The MacPhail Center for Music is building a new home in Minneapolis. MacPhail has unveiled the design for an expanded music center in the Mill District, in what's becoming a new cultural corridor. But MacPhail plans building a new future while breaking down some old walls. Minneapolis, Minn. — The fourth floor auditorium in the current MacPhail building was alive with a huge show and tell party. 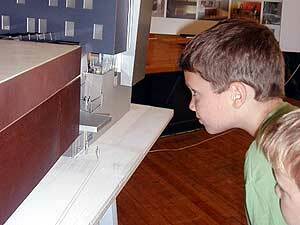 Kids performed on stage alongside their teachers, while friends peered at the design models for the new music center. This is the latest generation in a century long tradition of music education. MacPhail President David O'Fallon says it's a time for jubilation - the music school has been looking for a new home, and the right design, for a long time. "We took three years to get the next 100 years right," says O'Fallon. O'Fallon says the building will allow MacPhail music teachers to work with students in new ways. He also says it will help MacPhail to expand its work encouraging communication across cultural boundaries. "Hispanic and Somali and Hmong, refugees and immigrants from all around the world are coming here," says O'Fallon. "MacPhail has always been a center of excellence; we will be that with many more musical traditions as we go forward. That's very important to us." The MacPhail's current home in downtown Minneapolis is showing its age. It lacks both air conditioning and modern music recording facilities. O'Fallon says while MacPhail is excited about the move, it's also focussed on reaching out beyond its new walls. The center's expansion includes the creation of three "access sites" in outlying Twin Cities suburbs. "An access site will in essence be a smaller version of MacPhail," says O'Fallon. "So you can go there and have individual instruction, learn composition, explore different musical traditions, understand what it really means to strive for excellence and do it all closer to where you live. And you can drive to it and even park at it!" O'Fallon says MacPhail is currently in the quiet phase of its fundraising campaign. He'll announce the campaign and details of the project budget in a few months time. MacPhail will be moving just down the street from the Mill City Museum and the new Guthrie Theater complex. Principal architect Jim Dayton says it's daunting to design a cultural building for Minneapolis at a time when internationally known architects are creating monuments all over the city. But he says he's up for the challenge. "I'm a local architect who believes it's incredibly important to have those guys - Jean Nouvel, Frank Gehry and Herzog and de Meuron - come to town and build buildings for us," says Dayton. "I think it's important to set the bar that much higher. And now we have an opportunity with this MacPhail building; we're next!" The center takes its name from William S. MacPhail, one of the original members of what is now the Minnesota Orchestra. He opened the MacPhail School of Violin back in 1907. It soon expanded to teach other instruments and other styles of music. It's trained thousands of musicians including, among others, Lawrence Welk. William's son Stuart MacPhail says he was born into the business of music. "You know, I jokingly say I played the cash register more than I did my clarinet," MacPhail laughs. "My brother and sister were more musical than I, my father and mother were both professional musicians and I was a business manager for the school." Stuart MacPhail's time and attention appears to have paid off. MacPhail Center for Music has grown into one of the largest music schools in the nation. He says he's excited to contemplate the future of the center, especially the new satellite schools in the suburbs. "I do think our future lies in the neighborhoods, and we're going to try to do a good job of neighborhood teaching - a big job - because we want to spread music everywhere," says MacPhail. The MacPhail Center for Music plans to break ground on it's new home in 2006 and complete the building in 2007, just in time for it's 100th anniversary.